Last weekend was Karaoke night with my girlfriends. It went down like its supposed too...we were hilariously bad singers and out of control rambunctious. We drank to much and had WAAAAY to much fun. So it was a success. Picking out my polish for the outing was easy. When going out on the town in NYC what better polish to wear that Morgan Taylor's New York State of Mind. NYSoM is a black based polish filled with the prettiest mix of pink, blue, gold, and purple micro glitters. It's like unicorn poop the prettiest thing ever. Don't you love it. I don't know how you can't. What is your girls night polish choice? This is such a pretty polish! I don't have many girls nights out, but this looks perfect for it! I do love it. It's so prrreeettty. 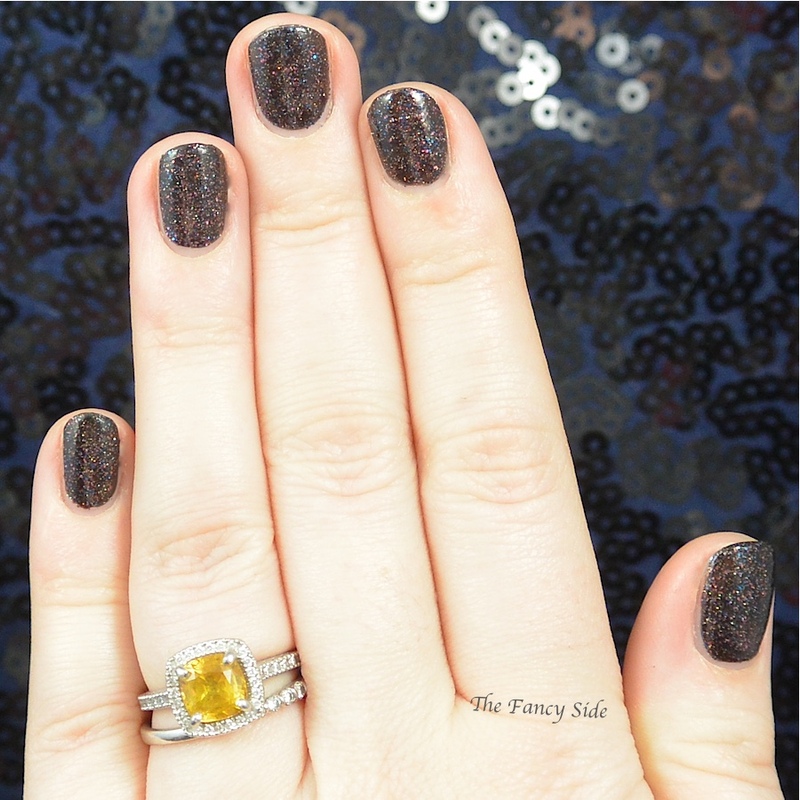 I'd choose something similar, actually...like Butter London's Black Knight. Thanks girl!! It was a great time. The only thing that could have been better was with you girls. glad you had a great time, such a pretty colour! That's a great choice, I do love it! Super pretty and so perfect for a girl's night out! It was and I had a great time, so BONUS! There you go. Everyone needs the gf who fawns over awesome manis. Those are also good choices! Wah! Girls night out? What's that? This is gorgeous! Better make it happen girl! Haha it does kinda look like what I expect unicorns to poop >.< Very pretty! Lol! Right, that was all I could think. Your mani is so pretty, perfect for a night out. Now if only I got out more... :-p Actually, my ladies nights usually consist of my two closest friends coming to my house with bottles of wine and I paint their nails, hehehe. Oh I'm all over Tina Turner Proud Mary. I do the dance and everything. I think wine and manis are awesome! Lol! It's a rare occasion for me, so I have to live it up when I can. I don't have girls' nights anymore since we've moved - need girls to have one lol Love this polish, and glad you had a good time!! It took me awhile to find a group once I moved but now that I have, its awesome! Thanks girl! Perfect choice! This is a nice polish. Gotta love a good girl's night out! That Morgan Taylor is so pretty! Weird, I didn't have any problems with chipping. I did get some tip wear though. I have that problem with other glitter based polishes though. It was a good one and much needed! Pretty swatches. I love wearing dark vampy colors for my girls night out. Makes me feel mysterious haha. I'm anything from mysterious, but you take what you get right? Karaoke with friends sounds like a blast! Loving your polish too! Thanks girl! It was super fun and much needed at the time!